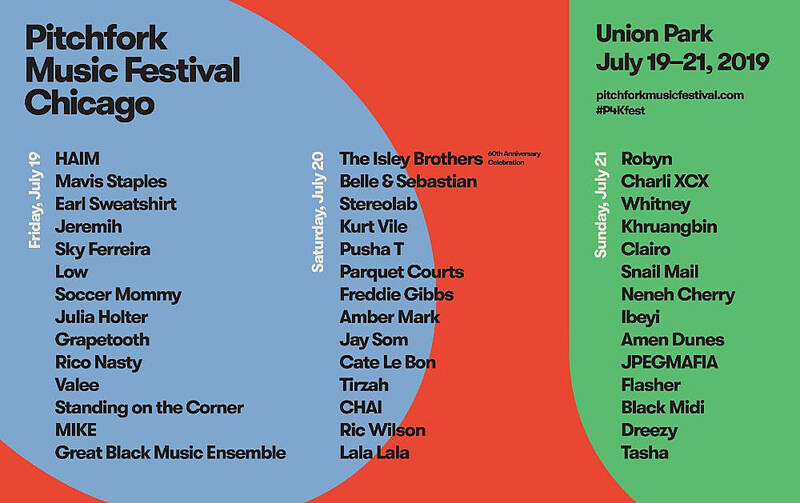 The lineup for the 2019 Pitchfork Music Festival has been announced. The headliners are HAIM on day one (“one of [their] only performances of 2019″), The Isley Brothers on day two (celebrating their 60th anniversary), and Robyn on day three. Day one also includes Mavis Staples, Earl Sweatshirt, Jeremih, Sky Ferreira, Low, Soccer Mommy, Julia Holter, Grapetooth, Rico Nasty, Valee, Standing on the Corner, MIKE, and the Great Black Music Ensmble. Day two also includes Belle & Sebastian, Stereolab, Kurt Vile, Pusha T, Parquet Courts, Freddie Gibbs, Amber Mark, Jay Som, Cate Le Bon, Tirzah, CHAI, Ric Wilson, and Lala Lala. And day three also includes Charli XCX, Whitney, Khruangbin, Clairo, Snail Mail, Neneh Cherry, Ibeyi, Amen Dunes, JPEGMAFIA, Flasher, Black Midi, Dreezy, and Tasha.